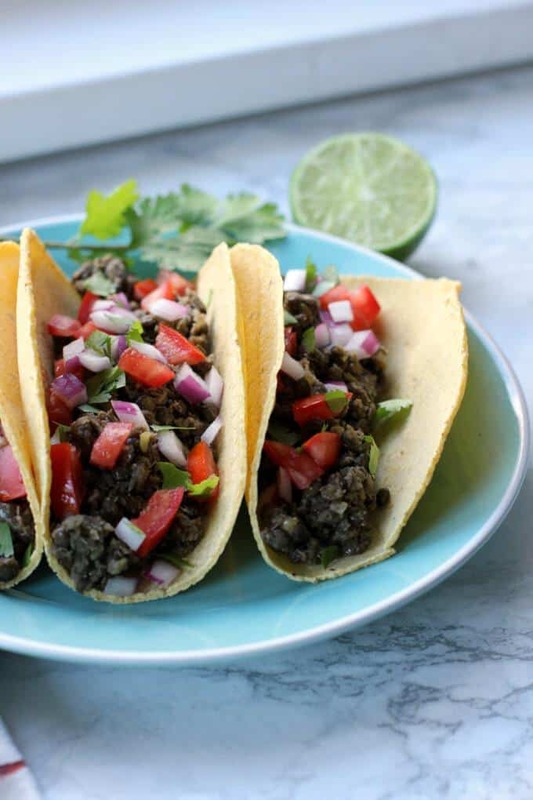 These vegan lentil tacos are full of plant-based protein and easy to assemble. Top them with salsa or add your favorite taco toppings. I’m not sure why it’s taken me so long to share a recipe for lentil tacos. Lentils are a natural fit for a plant-based taco filling. They’re hearty and “meaty” and they take on flavors really well. I like using French lentils for this recipe because they’re a little firmer than brown or green lentils, but you can use any of the above. The only lentils I wouldn’t recommend are red lentils because they’ll get too mushy. If you don’t eat a lot of lentils, now is the time to start. They’re a very inexpensive source of protein. (You can usually find them in the bulk bins!) They’re a good source of iron and they also contain a lot of fiber, which helps regulate blood sugar and keeps you full! Not to mention, they’re delicious in tacos. I like using french green lentils for this recipe because they hold their shape a bit better than regular brown or green lentils. But feel free to use whatever you have; I’ve made it both ways and you really can’t go wrong! Be sure not to overcook the lentils. The texture is best when they still just slightly firm. You can add any toppings you like but I highly recommend fresh salsa and veggies. 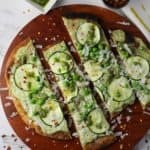 You could also add a few slices of avocado on top! Optional toppings: avocado, pico de gallo, cheese, etc. Add the onion and garlic and cook for 5 minutes, stirring to prevent burning. Add the garlic powder, cumin, onion powder, and chili powder and stir until the onion is coated. Add the lentils and vegetable broth and bring to a boil. Simmer for 25-30 minutes until all the water has been absorbed and the lentils are soft, but not mushy. You may need to add a bit more water if the lentils are still firm to the bite. You can either use the lentils as-is, or you can pulse in a food processor for 8-10 seconds to get a more chunky “meaty” texture. 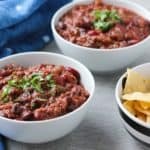 This technique works best with french lentils. Divide into taco shells and add toppings. I could eat this taco filling with a spoon, it’s so tasty. You could also add this to a taco salad if that’s more your style. We’ve had ours with avocado and cheese but we’ve also kept it simple with just pico de gallo. The lentil “meat” has a lot of flavor on its own, so I don’t usually add a lot of other toppings. 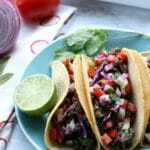 If you’re looking for something to serve it with these lentil tacos, try this Mexican Street Corn Salad! 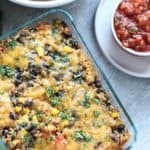 It’s a perfect side dish and it’s way easier to eat than traditional street corn! You could also make this 5 ingredient guacamole, which is delicious on top of any taco. What’s your favorite taco topping? What a gorgeously healthy, protein-rich recipe. As a vegan, this has been emphatically bookmarked. Love it, so fresh! These sound fabulous, and I know I wouldn’t miss the meat at all! 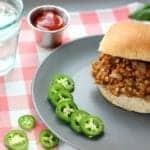 Lentils are so versatile, I love them as a side dish or tossed with a vinaigrette for a salad, but I’ve never used them as a filling for tacos before. They look like the perfect meaty substitute, though. Trying this one! I could legit eat tacos every single night and now I have a fab recipe to add to my “Meatless Monday” taco menu! We do love our lentils and I think that cutting out some of the calories and fat from tacos is great. This is a fantastic recipe to add when you want a meatless meal. It’s a keeper. I was vegan for years but don’t think I ever made lentil tacos. Such a good idea! Sounds like a hearty and delicious filling. These look really good! I’m not usually a fan of lentils, but I will try anything in taco form! OMG these look so good. i’m def adding these to my recipe rotation for meal planning. thx for the recipe! I love lentils but have not used them in tacos…. perfect recipe to give it a try! Thanks! 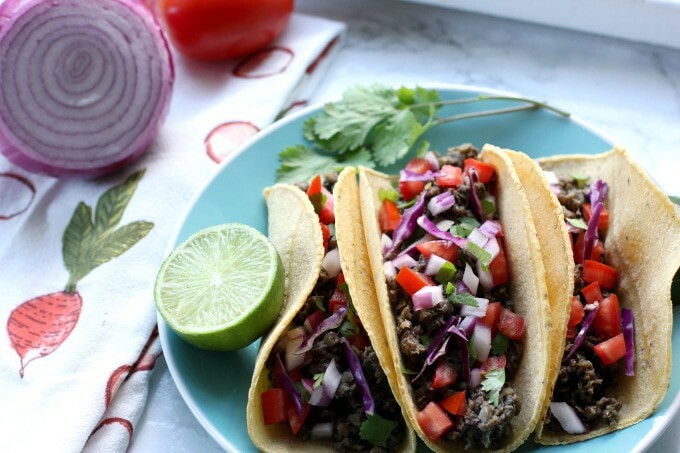 I love the idea of using lentils to make meat-free tacos! Delicious! 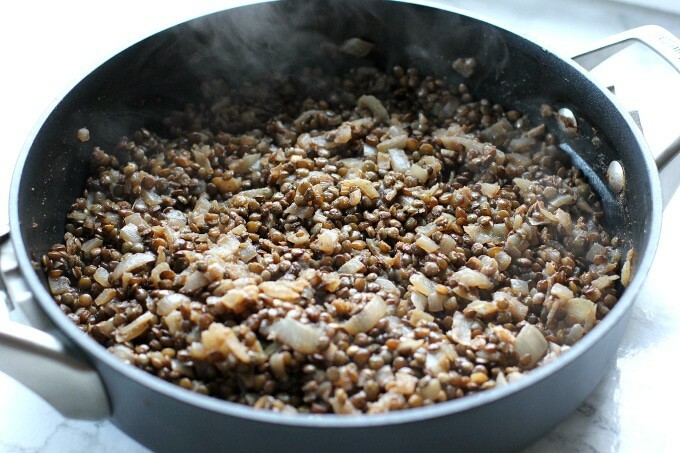 I love using lentils as a vegetarian alternative, this recipe looks awesome! What a great way to use lentils! Simply love the idea. Will definitely make it soon. II like more spicy food than most so I always up the amount of spices listed in recipes. I substituted a can of ROTEL with 1 cup of water for the liquid and used a taco mix for spices. Chili powder moistly is for color and not for spice so if you like spicy you will need to increase spices. That sounds tasty, Mary Ellen! Thanks for sharing!